Even a newbie baker can make this simple cake. If you thought olive oil is only for dips and sides, this recipe will definitely change your mind! Using Contadina Extra Virgin Olive Oil, we've whipped up a delcious and unique cake recipe you'll definitely love. Nigella Lawson, known as the Domestic Goddess vouches for the importance of using only good quality ingredients like Contadina, to produce quality food. Check out the recipe below! 1 Preheat oven to 325 degrees Fahrenheit. In a bowl, sift together all-purpose flour and baking powder. Add salt and sugar. Mix until well combined. 2 In another bowl, combine egg yolks, lemon zest, water, lemon juice, and Contadina Extra Virgin Olive Oil. 3 Mix together wet and dry mixtures until well incorporated. Set aside. 4 In a mixing bowl, combine egg whites and cream of tartar. Whisk until foamy, then add sugar and whip until stiff peaks form. 5 Gently fold the meringue into the batter. 6 Line bottom of an 8-inch cake pan with parchment paper. Divide batter among the prepared cake pans and gently tap them to release any bubbles. 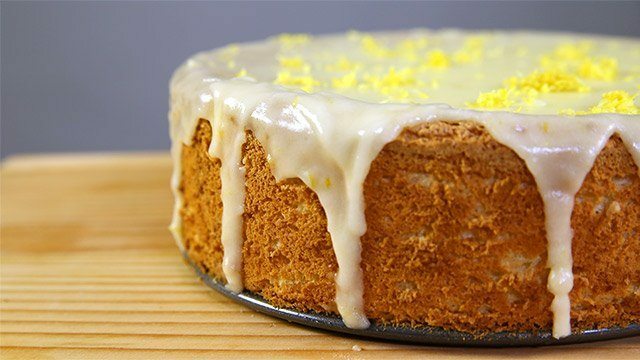 7 Bake for 30-40 minutes in preheated oven or until golden brown and a toothpick emerges cleanly when inserted into the cake. Invert upon baking onto a cooling rack, and let cool completely. 8 To make the glaze, combine lemon juice, Contadina Extra Virgin Olive Oil, powdered sugar and lemon zest. 9 Spread glaze on top of the cake and dust powdered sugar on top. Best served warm. This article was created by Summit StoryLabs in partnership with Contadina Spaghetti.